Venus in radar wavelengths and in visible light. Credit: NASA/JPL/RPIF/DLR. 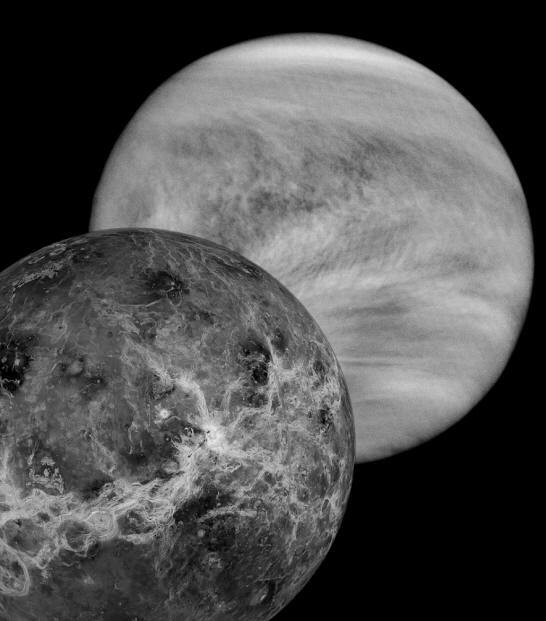 It has long been known that Venus and Earth are somehow gravitationally bound. According to a recent press release, an old theory about the resonant orbits of Venus and Earth has been resurrected. Whenever Venus arrives at its closest approach to Earth, called an inferior conjunction, it always turns the same face toward our planet. The implication of that arrangement is that Earth and its sister planet are exerting some kind of influence on each other. Since there is no other force known to astronomers that can act between planets, that influence must be gravitational. An inferior conjunction of Venus takes place when it is aligned between Earth and the Sun. At that time, it is approximately 41 million kilometers away from our planet. However, planetary scientists insist that gravity is too weak to form a resonant lock, leading to an Electric Universe theory that the two planets were once much closer. Venus is actually in near resonance with Earth. In order for an exact orbital resonance to exist, Venus would have to rotate in 243.16 days, but its actual period is 243.01 days. This close alignment suggests that it might be moving out of a resonant pattern that was once more precise. One factor besides gravity that might contribute to its face-to-face dance with Earth is that Venus has a long ion tail that extends outward for more than 45 million kilometers. During inferior conjunction, that electrically charged structure can interact with our magnetosphere. What if that electrical connection was much stronger in the past? "Venus, with its cometary tail, is evidently still discharging strongly today after a recent cometary past noted globally by ancient witnesses. Venus was described variously as a ‘hairy star’ or ‘bearded star’ and a stupendous prodigy in the sky. Today, Venus’ comet tail operates in the dark discharge mode and is invisible. It can only be detected by magnetometers and charged particle detectors." More than 60 years ago, a radical new approach to Solar System dynamics was placed in the public record by a brilliantly inventive scientist, Immanuel Velikovsky. Although various details of his theory have been revised in light of recent discoveries, his essential premise continues to inspire others, including this reporter, to pursue further insights. Prior to the Solar System we know today, there was another arrangement whose downfall became manifest in the mythology of every civilization able to record it for posterity. Once, perhaps as little as 5000 years ago, the planets were seen as veritable gods, with tremendous powers and chaotic aspects. Those godlike luminaries cast violent energies upon each other and upon Earth: boiling seas, melting mountain ranges, raising sky high tornadoes of fire, and hurling lightning bolts sufficient to vaporize any human work. The planet-gods did not revolve in the stately orbits we see today. Instead, they encroached on each other, looming large and then retreating, only to rush together in conflict again. During those encounters, Venus and Earth exchanged gigantic outbursts of electric discharge. In those bolts of interplanetary lightning they formed an electromagnetic bond. It was probably then that the orbital resonance that both planets share came into existence. As time passes, the intimate relationship once shared by Gaea and Aphrodite is beginning to fade. The long ion tail of Venus that continues to brush Earth with its faint electric tickle indicates that it is still in a state of discharge as it slowly regains equilibrium with the Solar System's overall balance. The past appearance of Venus as a terrifying comet with fire-like tendrils and monstrous features has been detailed elsewhere in these pages. For now, let it be said that the goddess is sleeping, and in her slumber we are drifting apart.